Men of honor usually spend the whole wedding day together with the newly-weds, that is why they will surely appear in the center of guests`, camera men` and photographers` attention. Consequently, they have to look like a million dollars. It is particularly difficult to find appropriate attire for a bridesmaid: on the one hand, she has to look gorgeous in the role and at the same time to satisfy own preferences. On the other hand, this is not going to be an easy day and it is difficult to resist the temptation of wearing plain and comfortable clothes. Should the bridesmaid give in to such a temptation?What kind of a bridesmaid`s dress model should she opt to? What color is it better to choose? Is would be great to wear a short dress or formal attire? How to make the right choice among different types of bridesmaid dresses? Let`s sort the thing out step by step. To start with, we would like to give future maid of honor a friendly steer: consult the bride before making any decisions concerning your outlook. Some girls are absolutely against the situation when their main helpers are dressed in the same color as the bride. Fiancée might also disagree with the fact when the bridesmaid wears too short or too pompous dress. Maid`s task during this day is to assist and help the bride, but not to bring her down. Remember when choosing bridesmaid dresses, the first thing you have to do is to ask the wife-to-be`s opinion. As it was said before, maid of honor should never wear a white dress, since it is the traditional bridal dress color. It is not only because wearing white she invades the bride`s rights. Also, if maid puts on white dress on the nuptial, she can be got wrong at the Civil Registry Office, restaurant hall and mistaken for bride. There is absolutely no need in provoking embarrassing situations. If the fiancée and her bridesmaid are both in white color, the latter can be lost against the bride`s appearance. What is worse, the two girls will appear as a big white spot on the photograph. Maid of honor is recommended to wear colored attire on the wedding day, so that both girls set off one with another. Black color is also unacceptable. This color is considered to be too sorrowful, especially against the background of vivid flowers and bright guests` apparels. However if you are in love with black color, and black dress is the only one you have, of course, you can wear it. Although it is necessary that you should spice it up with outstanding accessories or trimming. For instance, a pastel-pink ribbon can be tied in a bow below the bodice of your black dress; a silk red belt, a shawl, a pair of shoes or a clutch bag can give additional life to your style. If the bridesmaid prefers to wear a black, a good decision will be to dress the best men in white, and bridegroom– in black to match their couples in the pictures. It will definitely look rather unexpected and exotic. In order to make black and white atmosphere more casual, colorful ribbons should be made for the men of honor. Through it all, another color would be much preferable for the wedding. Designer dresses for the maids of honor are often pink, orange, terra-cotta, azure, light-green, honey, pastel-violet. Notably, that in most cases pastel tints, namely mild and tender, are used. Both silver and golden colors make a good choice for the bridesmaid`s attire. When she is not used to wearing light colored dresses, one is recommended to pay extra attention to evening gowns of chocolate, deep-red and dark-blue colors. People have mixed feelings about magenta colored dresses for bridesmaids. Scarlet color will capture the eye of public and will become the brightest stain on the wedding photos. Indeed, it is widely known, that all attention has to be focused on the main lady of the party – the bride. A-shaped dresses are the most widespread in designer collections of dresses for bridesmaids. It is a form-fitting dress with slinky upper and gradually flaring bottom without folds. Empire style gowns – high-waisted pleated dresses of a flattering shape – are also very popular among bridesmaid`s dresses. Straight attires, shift outfits can always be found in fashion collections. Mermaid style dresses, where silhouette is fitted throughout the bodice, hips and thighs and flares out below the knee can be found less often as they’re less comfortable. Shrug is usually worn together with a form-fitting dress. And it is widely known that suit-dresses look interesting and stylish. Trousers, skirts with blouses, form-fitting mini dresses, and dresses with bare back, light pinafores and ball dresses will never be found in designer collections for bridesmaids. Maid`s wedding dress can be both long and short. Low neck is also acceptable. However one should strike a balance: the shorter the dress the less plunging neckline it should have. Low neckline is possible only if you wear a long dress. By the by, according to the rules of etiquette long evening gowns can be worn only during the occasions which are organized not earlier than 5 – 7 p.m. 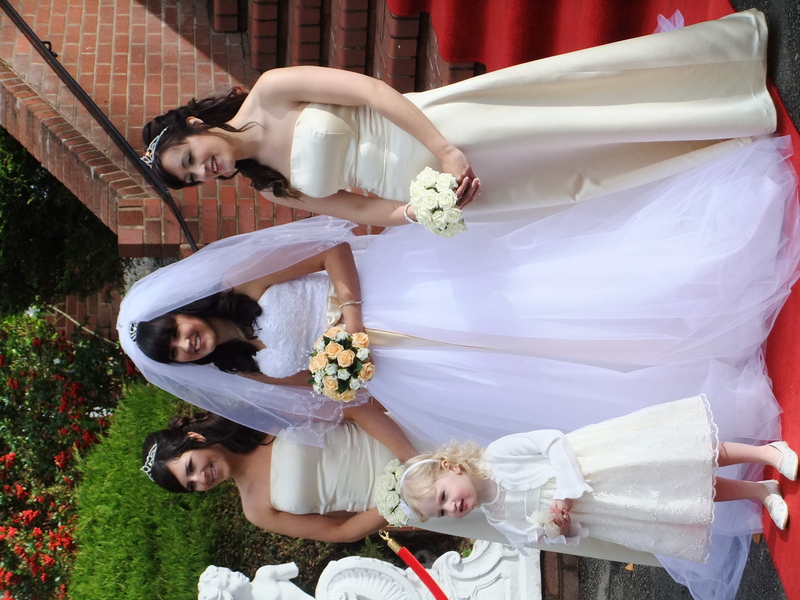 If the ceremony is planned at the daytime a bridesmaid wearing a floor-length dress is undesirable. As for the cocktail dresses, they can be worn at any time of the day. If you are eager to observe all the rules, purchase a cocktail dress (a little bit longer than knee-length full feather). Some girls prepare two dresses: the short one for wife purchasing ceremony, the ceremony and wedding stroll, and the long one for evening banquette. Though, this etiquette rule is constantly violated. Formal suit does not match the nuptial at all. Surely, such outfit as evening top with skirt can be put on, but it is better to avoid it. We straightforwardly recommend not to wear trousers, parti-colored and extraordinary dresses. Bridesmaid chooses her attire in accordance with a dress code if she participates in a theme wedding. But nevertheless, all style and color traditions are kept. If nuptial is organized in European style, there are two bridesmaids, instead of one. In some European countries and here the tradition when bride makes her own choice concerning the color of her maids` of honor dresses is followed. So then girls pay for tailoring themselves. In this case they make a common decision, if they should wear dresses of one or different styles. It is good, when they opt for the latter: on the one hand, all the girls will look like a bouquet of similar flowers, enframing the bride. On the other hand, each girl will have the opportunity to stay particular wearing an outfit which suits her best. Bridesmaid`s dresses palette frequently correspond to the color of nuptial decoration like bouquets, groom`s buttonhole and so on. The best men come in suits of the same tint, but their ties are to be equivalent to the color of bridesmaids` dresses. When bridesmaids` dresses are variously colored, they appear as a blooming garden. Of course, not to be mismatching, their garment should have the same style and be identically adorned. For instance, they can put on dresses with white polka-dots, but different background. Ribbons for men of honor can easily be substituted by flower necklaces. Otherwise, bridesmaid can put on a wristband made of flowers, the best man – buttonhole of the same fashion and color. It is essential that maids of honor should have purses. First and foremost, multitude of trifles such as facepowder or handkerchief, adhesive plasters or tampons might be needed during the whole long wedding day. Secondly, ladies can also keep important newlyweds` belongings like cell phones and the rings in their handbags. Shoes shouldn`t be high-heeled, otherwise by the end of the day legs will give way. By the way, bridesmaid`s shoes can be not only vivid, but even extremely bright. If bride is shorter than her bridesmaid, the latter is recommended to put on flat shoes. Cocktail and evening dresses for bridesmaids are sold in any wedding boutique. You can also easily rent a gown in many of them. Anyway, one should visit certain shops and try several attires on in order to make up her mind concerning color and style. Then you can purchase fabric and order tailoring, since designer cocktail and evening dresses for maids of honor are usually rather expensive. All in all, finding bridesmaid dresses is rather tough and significant task.